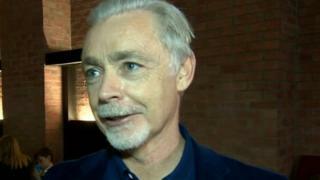 Irish children's laureate Eoin Colfer is teaming up with Marvel to write a new Iron Man novel for young adults. Colfer, famous for his Artemis Fowl book series, is a former primary school teacher from Wexford in the Republic of Ireland. Marvel said the Irish writer had created "an electrifying new take on the Marvel universe's most famous billionaire super hero". The Iron Man novel is due to be published in autumn 2016. Announcing the news, a Marvel spokesperson said: "Prepare to strap-in and enjoy these new adventures from some of the most critically-acclaimed authors working today. "Marvel Comics' most beloved characters are set to capture the imaginations of young readers everywhere with these brand new novels coming in 2016!" Eoin Colfer made his name with the Artemis Fowl series of books that quickly became bestsellers. Belfast-born actor Sir Kenneth Branagh has signed up to direct the Artemis Fowl movie. Aimed at the young adult audience, the fantasy books focus on a young criminal mastermind who kidnaps a fairy in order to expand his empire. Colfer also penned the sixth instalment to Douglas Adams' The Hitchhiker's Guide to the Galaxy.